“Some things were perfectly clear / seen with the vision of youth / no doubts and nothing to fear, I claimed the corner on truth / These days it’s harder to say I know what I’m fighting for / My faith is falling away / I’m not sure any more” —Billy Joel, ‘Shades of Grey’. “Every one of Joel’s important songs, including the happy ones, are ultimately about loneliness. And it’s not ‘clever lonely’ (like Morrissey) or ‘interesting lonely’ (like Radiohead); it’s ‘lonely lonely’, like the way it feels when you’re being hugged by someone and it somehow makes you sadder.” —Chuck Klosterman. There are artists which puzzle me in respect of why they get so much hate. Brand New, Weezer, Smashing Pumpkins, Mars Volta, Porter and Billy Joel. Yes, I’ve just paired Billy Joel with those once loved, now derided musicians. What’s with the hate? Let’s get the quick ones outta the way. Weezer had the temerity of not making Pinkerton again and again. Dunno, feels sometimes that fans are too proprietorial/navelgazing and never accept that bands change their sound. I’d rather have a band taking risks than stagnating in one particular sound (see: AC/DC, Coldplay, Aerosmith). Mars Volta and Porter, well, they are simply just strange, but I really don’t think they give 2 shits if they are dissed or bigged up. They do (or did, in Porter’s case) their own stuff and even if a constant is the randomness of their sound, half self-indulgence, half-experimental, I again like the fact that they do what they want, when they want. Brand New has already been covered on this site, so I’ll skip right into Billy Joel, an artist that pretty much was my soundtrack when I was 16. Those were the dark ages. And the light at the end of the tunnel hasn’t shined yet. His story wasn’t nice either. His first album, Cold Spring Harbor, was mastered at an erroneous speed, messing up his voice and upsetting him vastly. But from this bitter experience, inspiration was fuelled. And that could very well be the sum of his musical oeuvre: inspiration fuelled by bitter experiences. Hey, when one of your songs is based on the note you left when you tried to commit suicide by drinking furniture varnish, you know that music is the lifeline keeping you in this mortal coil. The classically trained Joel knows how to make a tune catchy and pleasing, sometimes bordering on easy-listening, most of the times just seemingly harmless. But it’s once you start paying attention to the lyrics that you know that you are in for a couple of emotional haymakers. The underlying sadness leaves a bitter, painful aftertaste. How about the lesser known singles that were big on their day and age but now are mostly forgotten? ‘Honesty’ is sweet, but the lyrics are too painful to listen because they are real life. “Honesty / is such a lonely word / everyone is so untrue / Honesty / is hardly ever heard / but mostly what I need from you “. Add to that a truly dirge-like chord progression and you get yourself a hit that manages to connect and have more substance than saying that you have a feeling that a night is gonna be a good night. (Editor’s note: Check the big handbag o’bitchness Sam is using – Q & M). But hey, let’s forget about the bigger hits, let’s say the big mammoth-like hits like ‘Piano Man’, ‘Uptown girl’ or ‘Just the way you are’ were never made. Let’s not even go for the obscure odd hit (‘I go to extremes’, ‘The Stranger’). No, let’s go for the hey, why isn’t this part of the collective consciousness? The sheer spitefulness of some of Joel’s songs is staggering once you start seeing between the lines in the lyrics. Asking for privacy in the way you run your life (‘My life’), dealing with selfrighteous and flashy individuals (‘Big shot’), accepting how weak you are in front of the significant other (‘Shameless’), admitting your shortcomings as an individual (‘I go to extremes‘) and venting out the frustration and pent-up anger from being betrayed by a close one (‘The great wall of China’). Heck, Billy Joel even decides to go against every single thing the American Dream thrives on in ‘Movin’ Out (Anthony’s song)’. You can’t go more antiestablishment in an adult contemporary song like this one, eschewing all dreams of John Q. Public, seeing them as the fallacy they are. And it inspired an excellent jukebox musical. The rockier numbers also had their share of longing and nostalgia: hear ‘Zanzibar’, ‘It’s still rock and roll to me’ and ‘For the longest time’. All tunes which act like little remembrances of good times that have faded. There’s some decent social commentary on some of his songs (almost in par with The Boss, arguably). ‘Allentown’ (factories downsizing), ‘Goodnight Saigon’ (Vietnam and its effect on the baby boomers), ‘The Downeaster Alexa’ (overfishing) and most important of them all is ‘Captain Jack‘, a song with a grittiness that is lost in all preppy hipsters that might very well be the target of the song. Even more to the brilliance of his lyrics is the fact that the first song I have a memory of directly dissing the whole music industry is 1972’s ‘The Entertainer’. With its Sesame Street-like happy music, the harshness of the message is somewhat lost, but it’s there, below the surface, waiting to come back and bite you. Hey, remember those bands I mentioned before? The lyrics for ‘The Entertainer’ apply to all of them. “Today I’m your champion / I may have won your hearts / But I know the game / You’ll forget my name / I won’t be here in another year / If I don’t stay on the charts”. Before you think Billy Joel is just generally bitching about everyone surrounding him, consider ‘The Stranger’, where the blame is firmly put into oneself. The introspective judgement of the song goes into an area where you realise that you can point all fingers that you want at the outside world, but the biggest one is the one in your direction. It is this admission of guilt that juxtaposes with the “blame the world” passive aggressive anger in ‘Honesty’. Yes, ‘The Stranger’ and ‘Honesty’ were a kick in the senses and I could feel the riptide of sadness going around, but it wasn’t until my dad bought me River of Dreams that I managed to understand how bad was it for Billy Joel. Although sounding like a toothless AOR pandering to the New Jack sound of the early nineties, there is a lot of brilliance here. The spirituality of ‘All about soul’, the middle aged wisdom from ‘Shades of grey‘ (my favourite from the album) and the tenderness of ‘Lullaby‘ are but three exceptional gems in this excessively derided album. Does it deserve the slagging? It sure doesn’t sound “safe” nor sounds as friendly as the older stuff he made, but if it made such an impact on me when I was but 17, imagine how I feel about it (and his whole catalogue) now that I’m 32? The more obscure bits, let’s say the ‘Blonde over blue’, now feel more like a reality than an “ah, that’s ages away from happening to me!”. It’s only when you realise that time is running away that you sit down and contemplate about the anger in you, the energy from pent-up anger and what do you want to do with it. Wallow in self-pity? Write another album? Do something different? There is a big depression inside all of us. 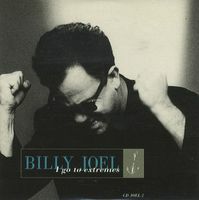 Billy Joel is our reminder that us, like Orpheus, are damned to never look back. Barring a few live albums, a classical album and more compilations, no other new albums (with lyrics) have been made since River of Dreams. 17 years of silence, only letting the music settling in, sinking in us. And that’s the chord that Billy Joel strikes: a lonely note reverberating, slowly fading away into a dark auditorium with nothing but a ghostlight as an audience. Posted in 70's, 80's, 90's, Apocalyptic stuff, Classy, Columns, Looking back at, Musicals, reviews, Starstruck writers who can't write for toffee, When editors don't do their jobTagged 52nd Street, Billy Joel, Movin' out, Piano man, River of Dreams, Shades of grey, Storm Front, The StrangerBookmark the permalink. hahaha, handbag? ME? How dare you, dear Misky and Quinto ? :P I’ll get back at ye!!! !